In a classical thermodynamic system, heat current flows from the hotter body to the colder one, or electricity from the higher voltage to the lower one. The same thing happens in quantum systems, but this state can be changed, and the flow of energy and particles can be reversed if a quantum observer is inserted into the system. This is the main result obtained by the group led by Professor Ángel Rubio of the UPV/EHU and of the Max Planck Institute PMSD, together with collaborators at the BCCMS centre in Bremen. Their study has been published in npj Quantum Materials. In macroscopic objects such as a current of water, observing the current does not affect the flow of the water and, in accordance with the laws of classical thermodynamics, this flow would take place from the upper to the lower part of the system. However, in quantum systems, "the process of observation changes the state of the system, and this makes it more likely that the current will be made to flow in one direction or another," says Ángel Rubio, a professor with the Hamburg-based Max Planck Institute for the Structure and Dynamics of Matter. Rubio says this does not constitute "an infringement of any fundamental theorem of physics nor is energy created out of nothing. 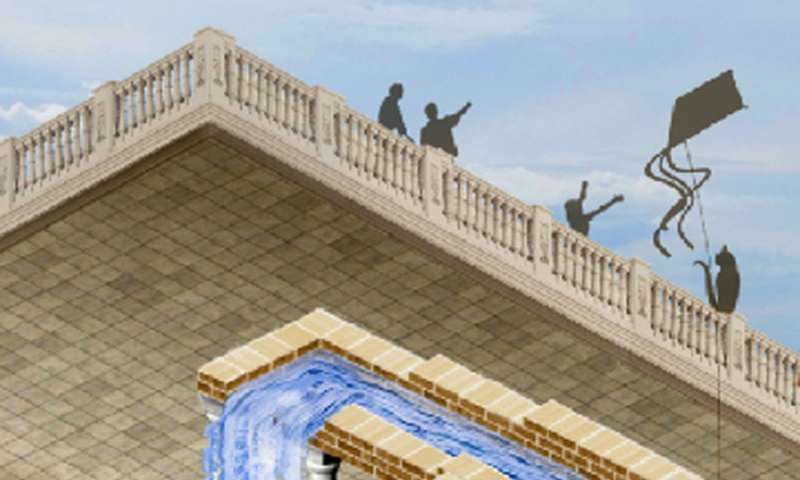 What happens is that inserting an observer into the system acts as an obstacle, as if you were to close off the channel in a pipeline through which the water is flowing. Obviously, if the load starts to build up, it would end up going in the opposite direction. In other words, the observer projects the state of the system onto a state that transmits the current or energy in opposite directions." Rubio remembers his surprise when discovering that inserting the quantum observer caused the directions of the current and the transfer of energy to change: "Initially, we thought it was an error. We expected to come across changes and we thought it would be possible to halt the transport, but we didn't expect there was going to be a complete change of flow. These changes in the direction of the current can also be made in a controlled way. Depending on where the observer is inserted, the flow can be changed, but there are specific areas in the device in which, despite looking, the direction does not change," he says. Controlling the heat and current of particles in this way could open up the door to various strategies for designing quantum transport devices with directionality control of the injection of currents for applications in thermoelectrics, spintronics, phononics and detection, among others. But Ángel Rubio believes these applications are a long way off, because he sees limitations in the design of the observers: "We have proposed a simple model, and the theory can be easily verified because all the energy and entropy flows are preserved. Carrying out this process experimentally would be another matter. Although the type of device that would need to be designed exists, and producing it would be feasible, right now, there is no possibility of doing this in a controlled way." Thus, the research group is now exploring other, similar ideas. "We're look for other mechanisms as an alternative to quantum observers that would allow similar effects to be achieved and which would be more realistic when it comes to implementing them experimentally," Rubio says. Start searching all the 'over unity' claims out there. A VERY large number of them will include data on device COOLING, not heating as it normally should, is expected. Not so crazy anymore, is it? As for over unity itself, yes the governments and corporations of the world also research it and openly spend billions on it, all the time. It's called Fusion. No different. The thing about fusion research, is that it allows for centralized control of the population to remain..... keeping the population under the thumb of oligarchy. Fusion it is!!! Nice profit margin too! Fascinating. Another study showing something amazing that we will never hear of again. And it has the word quantum in it too. Now if only there was some way to make quantum effects manifest at the macro level. I know, let's ask Deepak Chopra. I have an idea/theory based on expanded version of general relativity that explains negative entropy (aka dark matter), the key feature of it is it moves backwards in time - i.e. light travels along the temporal plane (what gravity pushes down on in relativity), dark matter pushes up on it (negative gravity) and mass down on it. So what we might have here is actually a way to measure (and possibly collect) dark matter - which would be a really cool find if true. And would it xpress itself as mass, yet unseen...? I'm not going to learn calculus because newton did it on the sidelines when working on alchemy whilst a lapdog for the royal scientific blah :) . I want to learn what makes sense . if quantum physics has to use doodles to explain itself then in my opinion enough said. the 20th century was and our economy presently is based on heat engines. rockets petrol oil fine yes but there is a limit too this madness. stop understanding teachers and overstand them . surely that is a point of a teacher . zen paradoxes are for goldfish. shrodinger and his cat . please!